This new embassy is not so much an actual embassy as it is a ‘branch office’ of the main embassy in Tel Aviv. Yet the US is insisting on the placement of the office in Jerusalem. And to make matters worse the date of May 14/2018 marks the 70th anniversary of Israel's "independence" followed one day later by the Nabka which marks 70 years of Palestinian displacement. Obviously the opening has been chosen to be intentionally provocative. Why? Why be intentionally inflammatory? The situation between Israelis and Palestinians could not be more delicate,” wrote Ilan Goldenberg, who served as part of the US team during the 2013-14 Israeli-Palestinian negotiations, in an opinion piece for the Israeli paper Haaretz. On the weekend ahead of the embassy opening, thousands of Israelis are expected to mark what they say is the city’s reunification in a Jerusalem Day rally. Often made up of religious settlers, These marches pass through Muslim district of the Old City and in previous years groups have chanted anti-Arab insults. The US does not need to do this. Why are they? 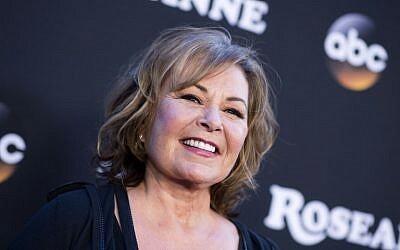 An interesting little observation: Roseanne is back. Apparently in her television show she is "pro- Trump"- Most probably she is pro- Trump in her 'real life'- She thanked Trump recently for moving the embassy to Jerusalem. "I said, 'Mr. President, on behalf of my mother, I want to thank you ... for moving the embassy to Jerusalem. Thank you so much,'" Barr said at The Jerusalem Post's annual conference in New York. "And he said, 'Well, you know a lot of presidents have promised it, but I wanted to get it done.'" "I think it's the first step to peace in the world, I really do," added Barr. Let's define peace, shall we? Trump is to propose his peace plan after the embassy opening. Me thinks that on the 12th the USGov.mafia will pull out of JCPOA. Then they'll get in the doggie position at the "branch" embassy in Al-Quds for their AshkeNAZI masters on the 14th... with war against Iran starting soon thereafter and the attempt to "force" Iran back onto the US dollar (though it won't happen and the US will slide into oblivion finally). It's interesting that crypto means "hidden"
and informally can mean a person with a hidden allegiance- so why not a 'thing' with a hidden allegiance aka crypto currency allied to Who? What?